Strapping on a pair of wrist weights when you go out for a jog can be more beneficial than you think. In fact, they’re great for a wide range of exercises and activities and will add weight resistance to your routines, making your upper body muscles work harder, expend more energy and use up more calories in the process. You can add them into a number of cardio exercises to boost your heart rate, getting better results faster, as well as use them for strength training. Shoulders, biceps and triceps will all benefit from the increase in resistance as you work out, becoming more toned and stronger and with enhanced stamina. Putting on even just 0.5kg on each wrist will make a difference to how much these muscles are worked during your sessions. All movements will require more effort as you up the weight that the muscles need to shift. 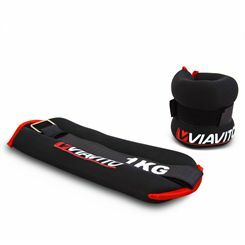 Whilst it may be more effective to pick up a pair of dumbbells or a kettlebell and spend time doing specific upper body drills, we don’t always have the luxury of time when it comes to exercising and this is where wrist weights, and ankle weights and weighted vests, come into their own. If you go for a run or do other such activities a couple of times per week but can’t fit in a strength session often enough, then wearing extra weight as you do so will give your body a harder workout. 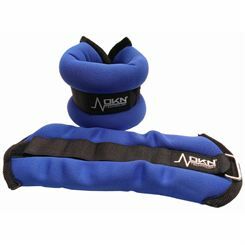 Your wrist weights should fit cosily around the ends of your arms, not too tight and not too loose. Start off with minimal amounts of weight not to put stress or too much pressure on your joints, and slowly increase the weight as your body gets used to it. 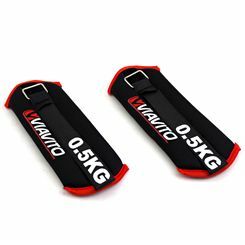 Their weight will normally range from 0.5kg to 2kg, with it not being advisable to wear more than 2kg (4.4lbs) on your wrists. 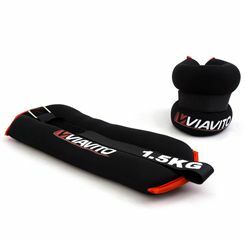 Here at Sweatband.com we sell wrist weights from the leading brands including DKN, Reebok and Viavito, and we offer very competitive prices and free delivery on orders over £15, so scroll up this page and have a browse of our range!